Other names: Rian kura-kurathe, tortoise durian. 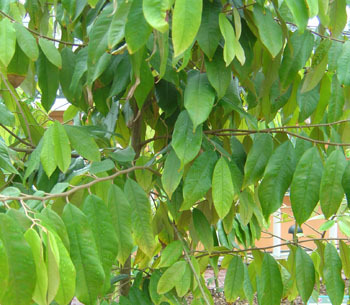 A very unique feature of kura kura tree is that the fruits which are borne from the trunk are nearly sessile and the bearing starts from almost ground level. 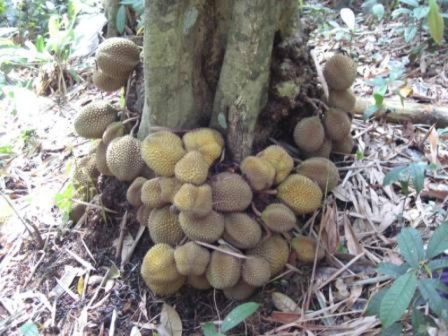 Large clusters of kura kura fruits hang from the tree just above the ground level. This feature of the tree makes harvesting very easy. A medium sized evergreen tree. 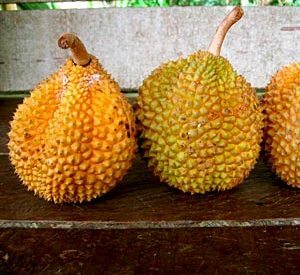 Fruits pale yellow to brown, flesh yellow, flavor is often described as being not as sweet as many of the other durians; Reputedly, the flesh is stinkier than the common durian and can take quite a bit of getting used to. Kura kura trees mostly grow in the forest. Trees can also be found on village common lands or home compounds but these are also not planted by anyone and are just protected. So there is no information available on the cultivation of this fruit. New trees can be raised from seed. The seedlings start bearing fruits in 5-6 years. 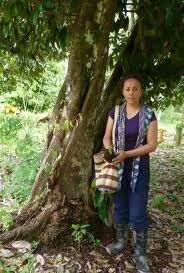 Apparently, kura kura trees prefer moist but well drained soils in a humid tropical environment.